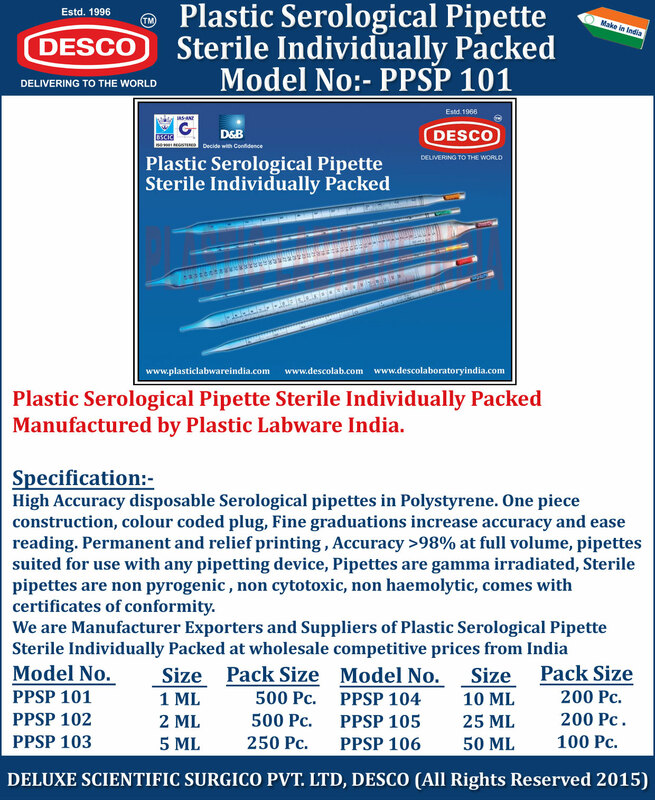 High Accuracy disposable Serological pipettes in Polystyrene. One piece construction, colour coded plug, Fine graduations increase accuracy and ease reading. Permanent and relief printing , Accuracy >98% at full volume, pipettes suited for use with any pipetting device, Pipettes are gamma irradiated, Sterile pipettes are non pyrogenic , non cytotoxic, non haemolytic, comes with certificates of conformity. We are Manufacturer Exporters and Suppliers of Plastic Serological Pipette Sterile Individually Packed at wholesale competitive prices from India. PPSP 101 1 ML 500 Pc. PPSP 102 2 ML 500 Pc. PPSP 103 5 ML 250 Pc. PPSP 104 10 ML 200 Pc. PPSP 105 25 ML 200 Pc. PPSP 106 50 ML 100 Pc.